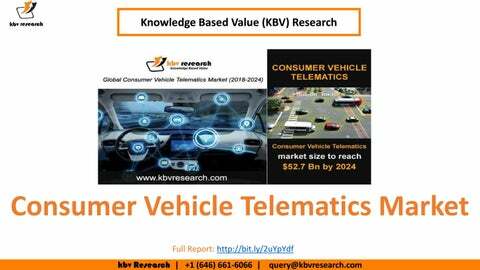 The Consumer Vehicle Telematics Market size is expected to reach $52.7 billion by 2024, rising at a market growth of 30.4% CAGR during the forecast period. Consumer telematics are the technology and services of communication that allow the transmission of large amounts of data to and from passenger cars in real time. The telematics systems placed inside cars includes the placement of a telematics communications unit (TCU) which is connected wirelessly to a centralized service center. The growth in the telematics market is driven by the increasing number of regulatory requirements for vehicle safety and safety. 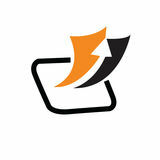 Estimation are made on market size and share, across segmentation and geographies along with market forecast . • A STEP TOWARDS INNOVATION OVERVIEW Knowledge Based Value Research is a global brand and consulting firm serving all kinds of business verticals, government and non-governmental organizations, and not-for-profit organizations. Our motto is to extend our services that will have a lasting impact on our clients who trust us with their business goals. DEFINED BY PEOPLE POWERED BY KNOWLEDGE – WHY US The market situation paved way to analytics as a tool, promising handshake between market research offering and demanding businesses. Abundant availability of data today makes its interpretation a mammoth task, and to pinpoint hidden insights is even more challenging a task. Knowledge based value (KBV) research is a brain child that bloomed as a promise to the business world. GLIMPSE INTO THE FUTURE OF MARKET RESEARCH – ANALYTICS TOOL The tool is a one stop solution to the subscribers to extract detailed information pertaining to the market segments, key influencing factors, market sizes, and growth rates with yearly performance mapping & forecasting and other various finer aspects. WEAVING BUSINESS STRATEGIES – CUSTOM RESEARCH We understand business needs; therefore, we have customizable research offerings to our clients. The scope of customization is defined by the client, agreed on by the analysts and the client to understand the feasibility of the demand.